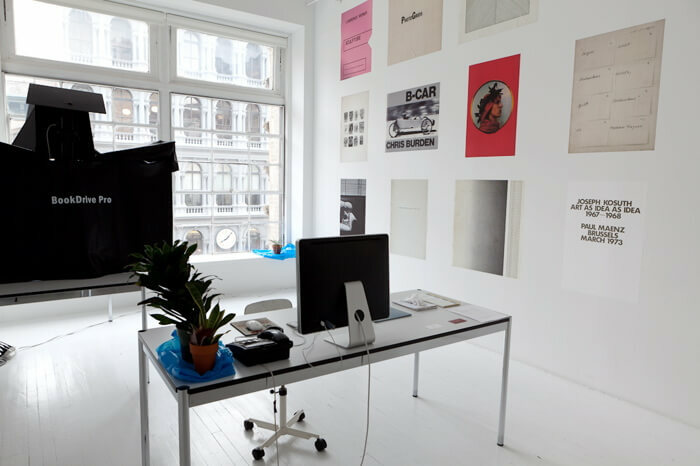 THE DOR is an ever-growing digital archive of out of print artists’ books. Spearheaded by Swiss artists Fabian Marti, Emanuel Rossetti and Italian artist Piero Golia, the project is founded upon the idea of accessibility and free information. Eventually, it will culminate in an online database of hard to find artists’ books, which users may page through and download. Currently, it finds form as a temporary office, where titles on loan are scanned, documented, and uploaded. Visitors may also contribute to this ever-growing library of titles. This project is made possible thanks to the collaboration of Shelley Fox Aarons and Phil Aarons, Printed Matter, and the generous support of Atiz.